“New is better. But these technologies come with an onslaught of unintended consequences. Easy is better. But as machines do more work for us, we do less; we’re less capable on our own. More is better. But as machines store and organize more, we get sloppy, forget our friend’s phone number, birthday, heartfelt concerns. What do you want more than anything right now? Stop and think about it. Do you want more information? More belongings? More connections? Do you want more time for loved ones? More focus and energy for creative projects? More Peace? To make a significant change, you need a good WHY. Decide WHY you want more time this year. What for? Your reason may be paying better attention to the people you care about, reclaiming time for a work project or hobby. Whatever you choose, it’s essential to have a reason because making the changes to get there will be tough. Chances are, what you want more than anything are more peace and meaning, more creativity and joy, not more hurry, more information, more stuff. Today, I’m going to show you one approach to removing the barriers in the way of building the life you want. Today, we’re going to reclaim time from all the places that nibble at it in little ways that add up to hours of our day, and the places that create big yawning holes we climb into and emerge after spending way more time than we meant to or realized. The first step is UNSUBSCRIBING to reclaim time. First, tackle your inbox. Unsubscribe from all unnecessary email clutter. Even the good stuff. What’s unnecessary? Marketing announcements, newsletters, anything that isn’t A) a deliberate correspondence from someone you KNOW, or B) a notification with required information or a call for immediate action- a utility bill, a security notice, etc. Basically, if you don’t need to respond to it immediately or it isn’t a person you know personally, and it keeps coming whether you respond to it or not, you don’t need it. This is a big deal. We lose a huge amount of time on unnecessary email. An annual digital clean-up can help you reclaim up to 100 hours a year. What would you do with it? The second step is TURNING OFF NOTIFICATIONS to reclaim time. Turn off all notifications except those from people. Notifications appear in RED because it’s a trigger color that instantly draws our attention. But notifications are generated by machines, not actual people. They keep our phones vibrating to lure us back into apps we don't really need to be in. Visit Settings > Notifications and turn off all notifications, banners, and badges, except from apps where real people want your attention; e.g. messaging apps like WhatsApp, FB Messenger or WeChat. I also urge you to switch the notifications you keep to vibrate instead of sound- they won’t interrupt you as stressfully or rudely to the people around you, and they won’t annoy or bully you into responding to them. You’ll know they’re there, but you’ll be in control. The third step is SPRING CLEANING YOUR SCREENS to reclaim time. Distraction-free screens are a huge advantage but they’re a big ask. Essentially, I’m telling you to remove functionality from your phone and other devices. This is especially hard when we’ve all grown accustomed to nonstop connectivity over the last decade. I love Jake Knapp’s article: “How I Turned My iPhone Into A Simple, Distraction-Free Device.” I recently followed his advice and gave my iPhone a spring clean. Get rid of social media, email, and news apps. Access these only from your computer. (Keep in mind that you can always check in on another device (ex. tablet) or reinstall if you really have to. A note about news: We love news but here’s why knowing more doesn’t help us: News, in fact, does not make people smarter, but it does make the world appear continuously less fair. Remove every app you don’t regularly use. The visual clutter that probably currently exists on your phone makes it more likely that you’re going to get distracted with an activity that probably wasn’t the reason you picked up your phone in the first place. Hide the existing apps in folders. By making the apps you do use require several deliberate steps, you’re short-circuiting the “autopilot” habitual behaviors that have crept into your phone usage- pulling your phone out of your pocket or purse and swiping without even realizing you’ve done it. This step ensures you’re using your phone because you actually have a reason to. No more than 8 apps per screen. Besides the distraction effect mentioned above, a more organized screen will let you do the thing you came here to do more efficiently- and it’ll force you to make meaningful choices about what apps you really need when you reach your 8-app limit on a screen. A distraction-free phone will help you reclaim margin for the things that truly bring you joy. I hope your first day full of reclaimed time feels good, uncomfortable, surprising, and new. I encourage you to use today’s three tips as a starting point- now that you understand the basic principle that things that tell you how to spend your time or short circuit your ability to decide for yourself aren’t real priorities, you can probably find even more time savings in your relationship to your devices. If you see yourself doing things without realizing them- and those things take you away from what you know in your heart you’d rather be doing or really care about- take control. Take action. Choose joy. When people tell you that they’re going to make your life better, they’re usually selling you something. As the digital age became the social media age, the always-on age, the stay-connected age, we’ve been told a lot lately about things that we never knew we needed to be happy and fulfilled. Except a lot of us aren’t particularly happy. Or fulfilled. Quite the opposite. I humbly submit that you should be skeptical of someone offering you a solution that only they can provide- especially a solution that requires you to get more “stuff.” I suggest that REAL paths to happiness are always things you can do yourself, using only your heart and mind and the people around you. I have a lot of ideas about how we can do this better - how we can all be better. You’re one of the people that want to be a positive force for change, and you feel, as I do, that one of the most important changes we should be making is to rediscover our connections to each other. Last year, I read the amazing book The Art of Asking by Amanda Palmer. It’s about community, art-making, human connection and the power of simply asking for help. Over more than a decade, Amanda has woven a web of relationships that sustain her creative work by just honestly presenting the value she wants to bring and asking her community to help her deliver it. My biggest takeaway was the powerful reminder that this online world - is just PEOPLE. That's right! The Internet is just people, wanting to be seen and loved from their corner of the world. Just like me. As it turns out, I LOVE PEOPLE! Do you know what I want more of in 2019? People. YOU. My neighbours. My family. The people I’m going to meet traveling and speaking this year. People. I signed up to support Amanda’s work on Patreon last year and it's an amazingly joyful experience to watch her make in her special way and knowing that, in some small way, I’m helping her do it. It’s a relationship. No more shouting /selling /promoting on social media. No fancy sales techniques. I want to invite you to be a part of something like that with me. I want to know you, and I want to build this with you. It’s time for me to make the big ask. Isn’t it surprising how hard it is to ask for what we need from others? I think a lot of us have been conditioned to be ashamed of it, especially when it comes to asking for people to really GIVE in a meaningful way - that we should be self-reliant, that everyone is out for themselves, that the only way to get anything from others is to hustle or fast-talk them. I disagree. I think we’re capable of more and better, and I invite you to contribute to my mission of proving it- and helping us all get there, together. 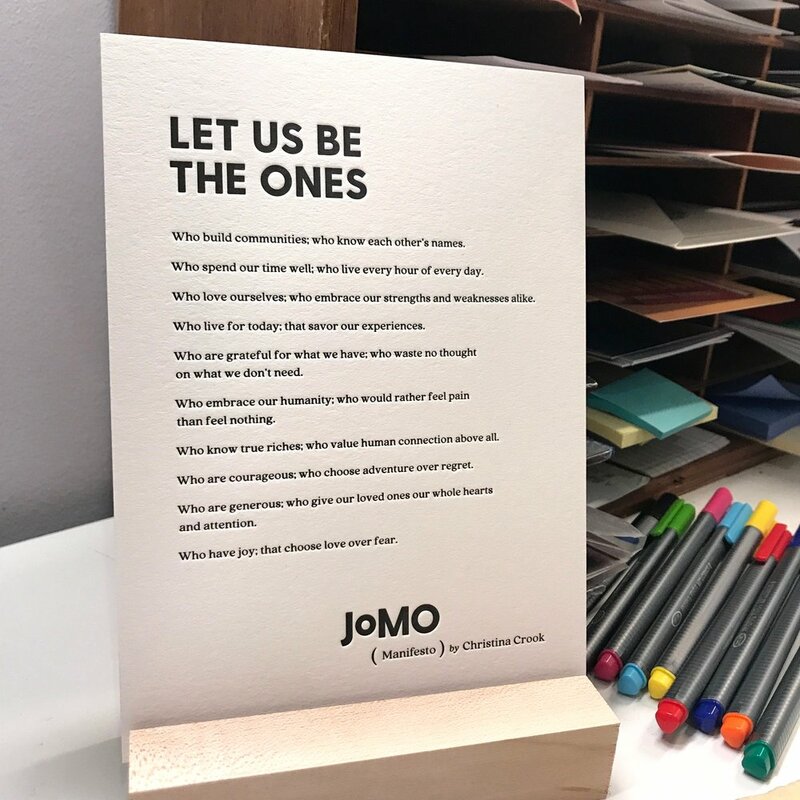 I invite you to become a JOMO patron, by doing so you’ll be the lifeblood I rely on to create the content and programming that will help inform, bring together, and delight. Every new patron will receive a handwritten card expressing my thanks to YOU personally. All members will be on an exclusive invitation list for Patron-only gatherings of the JOMO community. I’ll be keeping these small- intimate gatherings with myself and colleagues featuring art, music, science, and enlightening conversation with similarly supportive folks! I am working on a partnership with Artery.is to launch this later this year. To see the kinds of supportive content you can expect in the Patreon, take a look at this series I published about reclaiming attention, reclaiming time, and reinvesting that time and attention on life-giving commitments. I’m deeply grateful for the support, enthusiasm, and friendship of everyone in our JOMO circle so far. I hope you’ll join me on this new leg of the journey. JOMO, as I define it, is the joy of missing out on the right things: life-taking things like toxic hustle, comparison, disconnection, and digital drain in order to make space for life-giving commitments that bring us peace, love, meaning, and joy. I hope you’ll take the time to learn more and become a patron today. Your monthly patronage supports me supporting you. Cheering you on in joy!